The Victorian Electronic Records Strategy is about ensuring the creation, capture and preservation of authentic, complete and meaningful digital records by the Victorian public sector. View our 2018-2021 Strategy and Action Log. This will be achieved by enabling digital by design, automating and embedding born digital stay digital recordkeeping, and preserving reliable digital records for trusted access and discovery forever. Information held in paper is generally much less discoverable and accessible than digital information. PROV encourages Victorian Government to embrace born digital, stay digital recordkeeping approaches and avoid costly retrospective digitisation practices. Use this Born Digital Stay Digital Pathway to determine when records should be managed digitally. See our Digitisation page for further information as well as National Archives of Australia’s Reducing paper stockpiles guidance. Records of continuing value must remain accessible for as long as they are required. PROV has developed a long-term format called a VERS Encapsulated Object (VEO) for the preservation of digital records. Permanent value digital records* (as well as some long-term temporary records) should be converted into VEOs. System decommission or procurement provide opportunities for agencies to review records preservation requirements and potentially transfer records to PROV. 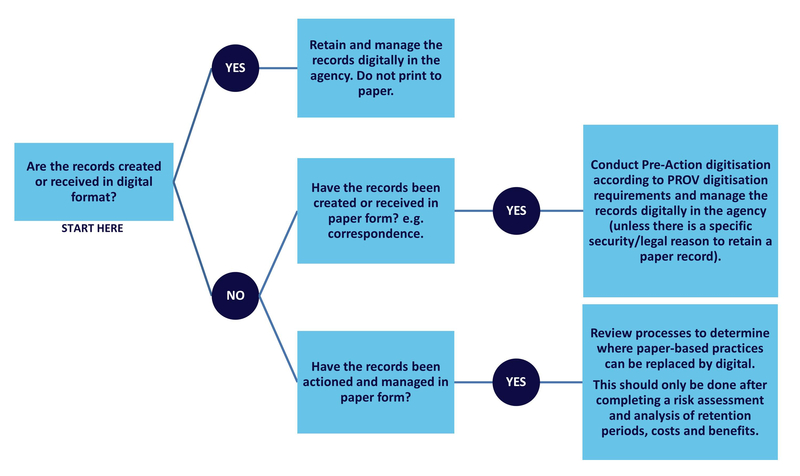 Use this Digital Records Preservation Pathway to determine when digital records should be converted into VEOs. See our VEO creation and Digital records transfer step-by-step pages for further information. *See our Appraisal page for further information about permanent and temporary value records. 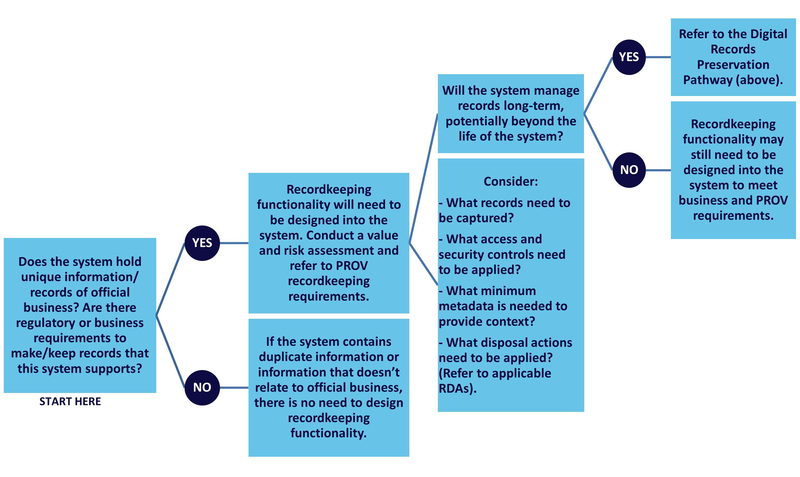 how recordkeeping can be actioned and/or embedded within the new system design. Use this Digital Recordkeeping by Design Pathway to determine recordkeeping requirements for business systems. See State Archives and Records NSW’s Checklist for assessing business systems and PROV’s Recordkeeping Standards for further information. See our Document Library to find Retention and Disposal Authorities (RDAs) applicable to your agency. What are VERS encapsulated objects (VEOs) and how to create them?